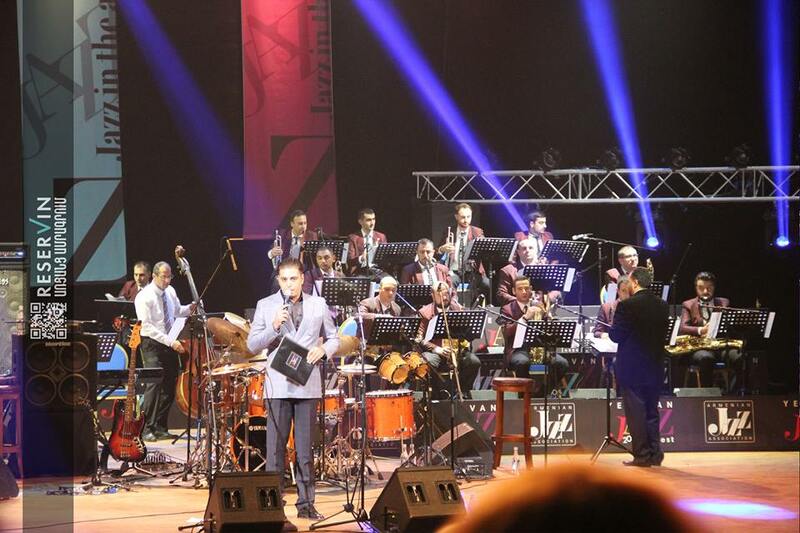 Last year at the opening of Yerevan Jazz Fest 2016 the founding president of Armenian Jazz Association Kamo Movsesyan promised that the festival will gradually become more popular, and the guests’ and participants’ names of this year’s festival are the bright proof that he has fulfilled his promise. During the press conference, that took place on October 13, Mr. Movsesyan noted, that next year the festival will become more widespread, and a lot of work is being done for that purpose. 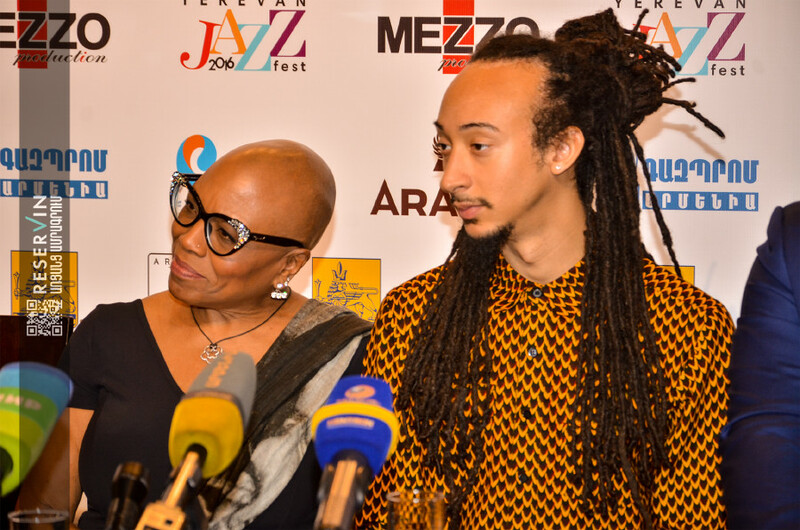 Well, let's wait for the next year, meanwhile, we represent You details from Yerevan Jazz Fest 2016 headliner’s Dee Dee Bridgewater's press conference at Mezzo Classic House, where she has answered the journalists' questions. Note that the star has come with Teo Croker (trumpet). Good morning. It's Your first visit to Armenia, what feelings do You have? Good morning. I want to mention from the beginning that I have always wanted to come to Armenia, and it's a very emotional and happy moment for me now, that I have the opportunity to be here and share my feelings with you. I really don't know from when and what my great desire to come to Armenia appeared. I have heard of Armenia for the first time when I was travelling with concerts across the USSR, at that time I have already known about Aznavour and his armenian roots and then, when I moved to France, I began to learn more about your country. The next step was when working with Ray Charles, when I began to gather my music band and got acquainted with Patrick Manukyan, who, besides being a wonderful musician, was also an interesting interlocutor, and we have talked together a lot about genocide and the horror through which Your people went through. I felt like I have passed through that myself. After that I have always wanted to come, see and understand You. When I was offered in Vienna to come and take part in this festival I agreed at once. It’s also important for me to talk about Your country for making the other musicians hear and know about You. For example, Teo is a young and talented fellow, I see the future of our Jazz with him, and it's important that he realizes that it's a great success and a big opportunity for enriching experience for an american musician to come and to perform in Armenia. 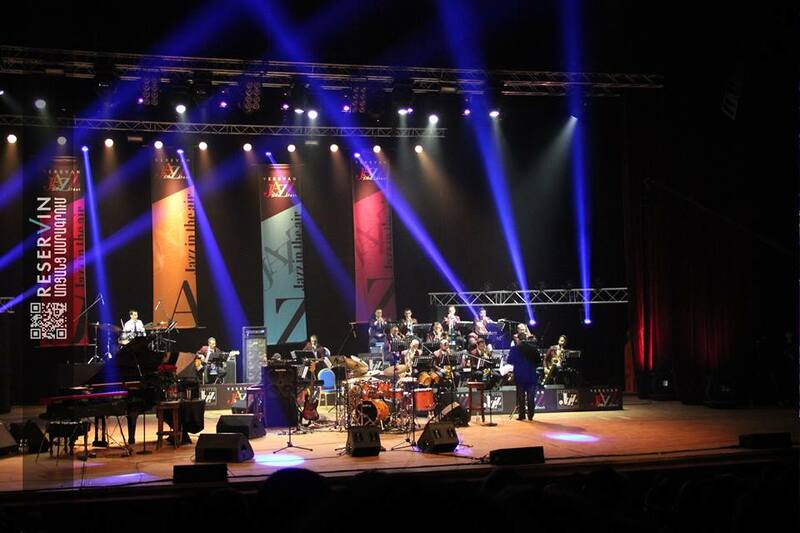 What do You know about our Armenian jazz culture which is already 75 years old? 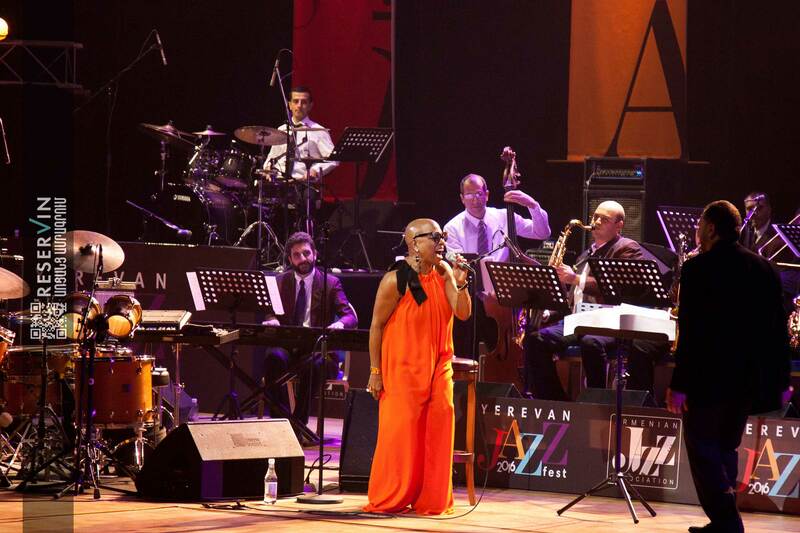 Who do You know from our jazz musicians and do You have a favorite armenian performance? Honestly, I don't know anything about armenian jazz, now I can't recall any armenian performer, except Tigran Hamasyan, whom I was lucky to hear at radio during one of my interviews. I have performed Aznavour's some songs and I think that this festival is a very good opportunity to get acquainted with armenian jazz. From what age have You begun to sing and why have you chosen jazz style? I can't tell definitely from what age I have begun to sing but my mother swore that when I was not even one year old she was switching on Fitzgerald and I was swinging under the rhythm of the music and I could reproduce the music with my voice. In fact, I have begun singing earlier than speaking. I have always sung and thought that it's a thing that anyone can do. I have been listening to jazz since childhood as jazz music always sound in our house. When I was 14, I found out that my friend didn't know who Miles Davis is and other famous jazz musicians were, and it was a big surprise for me. Jazz always sounds inside of me, it's in my veins, that's why I have chosen this way that was very unique and mine, it was my essence. Which is the music of Your heart? Is there a song that is very important for You? There are many songs that have been important in different stages of my life. The first song that has a great value for me and had a great influence on me is Nina Simone's «Four woman» song, which I have heard at the beginning of 1960-s when I was a teenager and was seeking my own «I». That song opened a new door for me, it gave me self-confidence and pride for my african roots because before that I looked different from the beauties of magazines, and that song, representing the beauty and uniqueness of 4 different women, helped me to establish myself and move forward on my chosen way and in my own manner. You're a beautiful woman, it's impossible not to admire You. How does your appearance reflect Your inner world and help You perform on the stage? If you mean my hair, I must note that I have reached the age and status that I don't need to establish myself, to prove or make my music presentable with my appearance. I choose myself the music that I will perform, and I perform what is mine, what reflects my «I». I have shaved my hair 9 years ago, when I was overcoming one of the most difficult stages in my life- emotions concerning my second divorce. I noticed that people pay a lot of attention on appearance, that hair disturb, after shaving them I noticed that people have begun to look into my eyes more and pay attention to the inner world instead of the appearance. I shaved my head for the second time in 2007 when I wanted to reach spiritual peace and harmony. We women have always struggled for our rights and we spend lot of time and money to have an appearance to prove that we are beautiful, strong, sexual and etc. I want people to look at me and hear the voice of my soul, see my inner world. I have reached it, I am in harmony with my skin color and appearance, I think that the beauty of a person comes from his inside and other jewelry and accessories are superfluities and only disturb. Besides, I'm a member of several public companies which help women who fight against cancer or other illnesses, who lose their hair because of the disease, and I prove and give them strength with my appearance that they understand that the real beauty has nothing to do with appearance, it comes from the inner self-confidence and the belief toward own self. Do You know George Avagyan, have You ever met him? I must be honest and say that though I have known and heard about George Avagyan but I have no idea what huge investment he has had in the formation of jazz. I have learnt in the framework of this festival that such superstars as Louis Armstrong and Miles Davis have been formatted by him for the first time. I had a very good accountant with Gevorgyan surname and now I can say firmly that You armenians are a very interesting nation- talented and modest , you pave your way with your diligence and talent. You should take steps to make the world, especially the cultural world, know you better. Actually, when I don’t work I sleep, I can sleep for days and don’t get out from my bed. I stay at home, I sit in my car and just move around, visit my relatives. Will You tell about Your collaboration with Ray Charles? Those were the most beautiful 2 years of my life, my memories about time working with him in the studio are unforgettable, we recorded all the songs after two rehearsals. The first time when he began to sing I just began to cry hearing his voice. 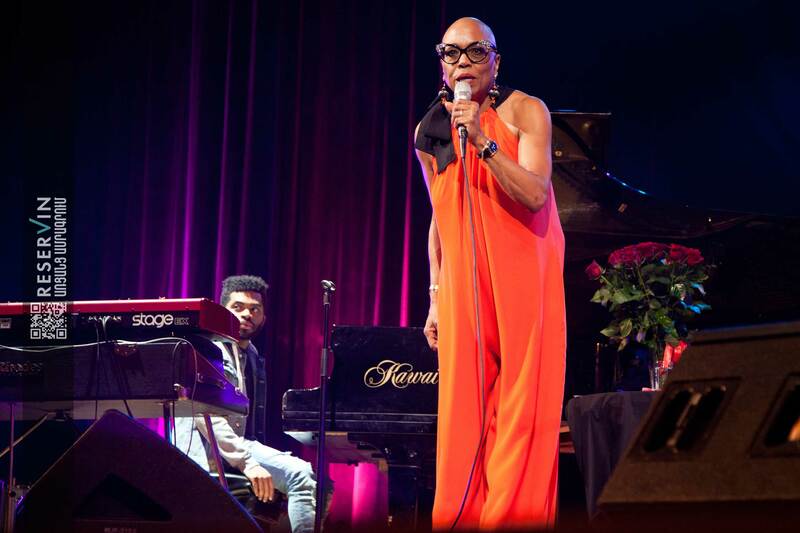 I was confused, I thought that I didn't have such a good voice and talent to sing with him, but he encouraged me and said that my voice was very good and my voice was the first one after Betty Carter's that inspired him to record a duet. And we recorded that song after one rehearsal. Thus, those 2 years when we were working in the framework of a TV show gave me a lot. We had few concerts together during that time but we were spending the most part of the day creating together, he insisted that I was beside him even when he was dining and he often invited me to have a dinner or supper with him, he always asked me to sit near him in the plane and even when he was flirting with other women he insisted that I didn't go and stayed. I have also witnessed his anger. In France a journalist, who was my fan, wrote a big article about me and put my big picture on the first page of the newspaper. It has made him angry and he forbidden me to perform with him that day saying that the show business was like that and he was the star, and I was just with him. I stayed at the backstage during the whole concert and didn’t perform. Once we had a concert in Italy and I had a problem with the airplane, we have landed in another city, I was 6-months pregnant, I had to spend 3 hours in car to get to the concert. I was sure that I was late and my concert was already over. But when I reached it turned out that he had stopped the concert and made everyone wait for me. When I arrived he said that it was the minimum that he could do for the atonement of the sin of the concert in Paris. He had taught me a lot of things- to be humble, modest, patient, to perform by 100 percent at the concerts, give more than you can. How did Your and Teo’s collaboration begin? Teo is a very talented trumpet player from Shanghai, I have got acquainted with him there. He has a very interesting genetic heritage which is often expressed in his creative life. His grandfather has been a very famous bugler and when working with Teo I often notice that he plays in the same style no matter how hard he tries not to be like him and not to reproduce. I, as an already formatted, have taken on me a responsibility to find talented young people and help them to be established. In this case I have, maybe, chosen Teo because trumpet has always had a big role in my life- my father and my first husband were buglers, and I often think that my voice also sounds like a trumpet. I have great hopes with Teo. We have been working together for 4 years and I try to help him to pave his path. He already has his CD, and you will also have an opportunity to listen to him and be persuaded in his talent today. Հանդիպում ենք օգոստոսի 25-ին և մոռանում ամեն ինչի մասին մինչև..
Today is Friday 13th and here is what you have to..
On April 16, Christian world celebrates Easter. Armenian Apostolic Church as..